A Rainbow Flapper Costume including a Dress and Headpiece – Ideal for Pride events, Festivals, or any other fancy dress occasion! Wear this Rainbow Flapper Costume Pride and grab the crowd’s attention in style. This costume comes complete with Dress and Headpiece. This short dress features a fringed design, with rainbow layers, a large red bow and straps. The Red sequin headpiece also features a red bow which is offset and adds the final touch to this Rainbow Flapper Costume. This attention seeking costume is perfect for Pride events, Festivals, or any other fancy dress occasion. This brilliant Rainbow Flapper Costume is sure to make you stand out amongst the crowd no matter what the occasion! 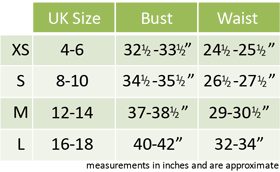 Size guidelines: to fit UK sizes 4-6, 8-10, 12-14, and 16-18. A Rainbow Flapper Costume including Dress and Headpiece.